Artist James Christie Prowett (1865-1946) was the only son of James Prowett, a watchmaker and jeweller in Bannockburn. He was educated at Wilson’s Academy and Stirling High School, where he was taught art by Edmund Baker. He served as apprentice to the Stirling architect John Allan, but fine art held a greater appeal. Prowett studied painting in Paris and Italy and on his return to the area established a shared painting studio at Beaton’s Mill by the Bannock Burn with another artist, George Smith R.S.A. (1870-1934). The two artists lived in the studio during the summer months and spent the winters in warmer climates. 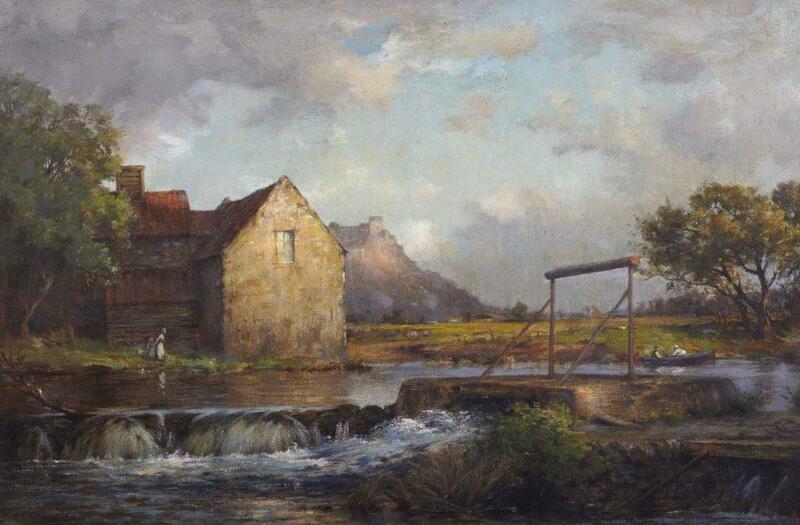 This painting of the Mill at Craigforth was gifted to the Smith collections in 1944. Associated with the Cambuskenneth group of painters, Prowett is best known for his studies of the Belgian city of Bruges, one of his favourite painting places. Prowett exhibited regularly with the Stirling Fine Art Association between the years 1894 and 1938, and also exhibited with the Glasgow Institute, Royal Scottish Academy and Royal Scottish Society of Watercolourists. Failing eyesight during the last ten years of his life ended his painting. Prowett and his wife Anna Lees lived at Beechville, Cambusbarron from 1891 to 1897, then at 6 Dean Crescent, Stirling until Anna died in 1937.